Color(s): Black and tan, golden brown, plain black, or grey with or without tan markings. 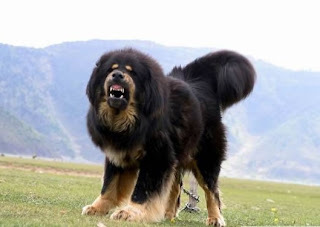 The Tibetan Mastiff is very loyal, protective and a brave breed. They are used as a guard dog as well as work dog. It is a very sensitive breed, owing to which they seek a lot of attention and if they do not get the attention they want then they tend to be quite destructive. This is a strong, brave and very intelligent breed. They require early socialization and obedience training so that they may get along with others well. They are wary of strangers and bark when they see one in sight. Due to this very reason they make excellent guard dogs and are in demand. They do well with mature children and older people but are not recommended for first time owners. This breed has a double coat. The under coat is soft and acts as a weather resistant coat whereas the outer coat is long and thick. It is a very defiant breed and will not respond to harsh methods of training. Thus, the training needs to be done fairly, firmly, devotedly and patiently. This breed requires daily exercise and enjoys long walks and family play sessions. They are apt for apartment living provided they are given sufficient exercise. Grooming of Tibetan Mastiff's is easy and bathing needs to be done only when mandatory. However, the coat should be brushed on a regular basis in order to avoid dirt and dead hair.